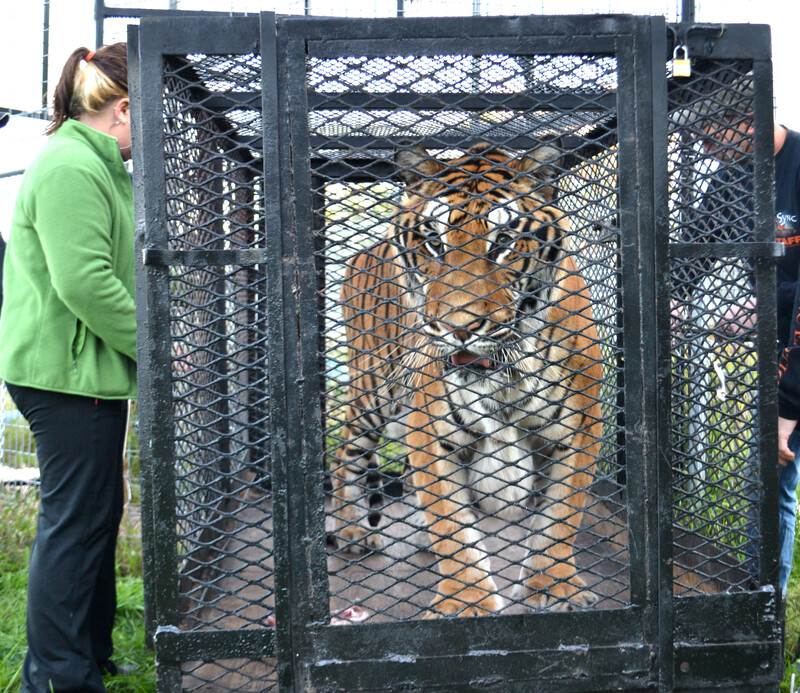 Tonka had been living at this event center for 12 years, since he was purchased as a cub. His brother had already been given away to another facility and had since passed away. Having been declawed on all four paws, Tonka needed a home with soft ground for his tender paws and room to roam. 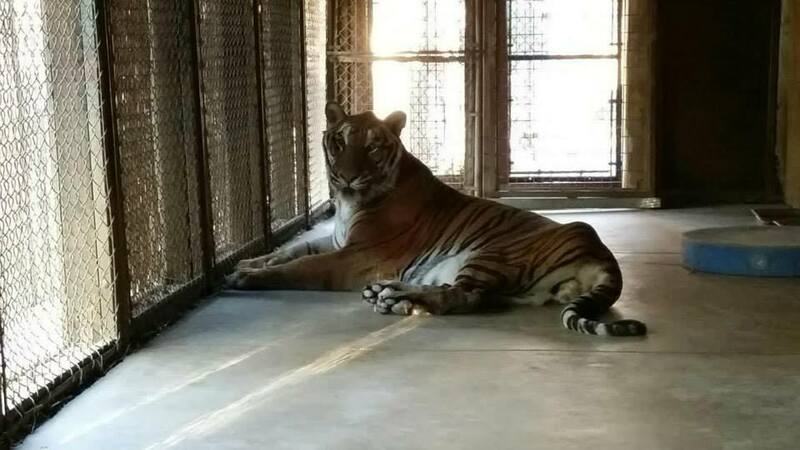 He’d never had much more than the 30′ x 40′ exhibit cage he was living in there. While IFAW negotiated with the owner, trying to convince him to surrender all his exotic cats, we agreed to take them all in. Tigers in America offered a 50% match (up to $5000) in order to help us pay for the needed habitat enhancements and long term care for Tonka. Another sanctuary offered to take in a lynx from the event center and provide transport for the cats to us, too. Everything was in place. But then, the owner decided he would not surrender all his cats. We stood by our commitment to give Tonka a home, as well as the two caracals he agreed to release to us. We also offered, in the spring, to pick up the two servals he still has on display there as well as his remaining white tiger. Tonka and the caracals made the long two day journey and arrived in the wee hours of a Sunday morning. At daybreak, he was more than anxious to get out of his transport carrier. 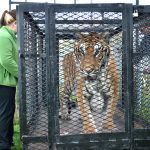 When the transport gate was lifted, Tonka excitedly ran right out into his new habitat and began exploring every square inch of it. He was chuffing and walking all over the habitat, obviously so thrilled with the newness of it all. 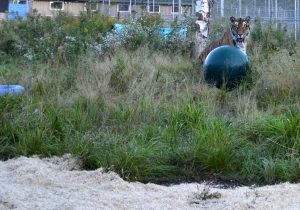 When he got over to the special shaved wood bedding we’d put in for him, we laughed seeing him dancing on it. He wore himself out very quickly since his back end is atrophied and weak. 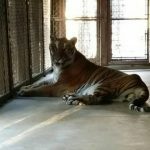 Our hope is to rebuild the muscle strength he obviously lost over the years while on exhibit. Layla, his next door neighbor, may be 23 but she’s a very spry girl and immediately came over to check out who the new guy in town was. And then, the lions started roaring their very own special “Welcome Home Tonka” and that really was a tearjerker for us. Tonka’s ears perked up to that sound, something he’d never heard before. Tonka knows, without a doubt, he’s in his forever home – finally. While Sundays mean the start of a new week for most of us, for Tonka, this particular Sunday meant the start of a new life. We’re so grateful to all our supporters who helped with this happy “beginning” for him. PLEASE DONATE HERE to help with the long term care for these cats, as well as the 100+ others we provide care for every day. If you’d like to become Tonka’s sponsor, you can SPONSOR HERE.